Actualizado el 12 de febrero, 2019 - 15.24hs. 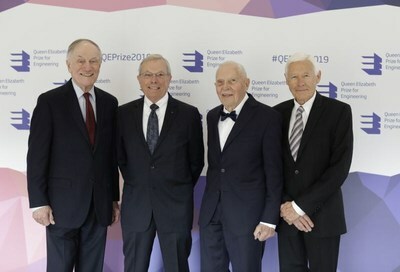 Today the 2019 Queen Elizabeth Prize for Engineering (QEPrize) is awarded to four engineers responsible for the creation of the first truly global, satellite-based positioning system (GPS). The QEPrize is the world's most prestigious engineering accolade, a £1 million prize that celebrates the immense daily impact that engineering innovation has on the lives of billions globally. In the presence of HRH The Princess Royal at the Royal Academy of Engineering, Dr Bradford Parkinson, Professor James Spilker, Jr, Hugo Fruehauf, and Richard Schwartz were announced as the 2019 winners by Lord Browne of Madingley, Chair of Trustees for the QEPrize. The development of GPS has fundamentally transformed nearly all elements of global society and is regarded as one of the most pioneering inventions of modern times. Today, an estimated four billion people around the world benefit from its free, accurate, and instant position and timing information. Its applications range from navigation and disaster relief through to climate monitoring systems, banking systems, and the foundation of tomorrow's transport, agriculture, and industry. The winners, building upon a set of novel technologies, integrated highly stable compact atomic clocks with what is now the GPS civil signal. This integration allows receivers to determine their position through trilateration - measuring the distances to multiple satellites simultaneously. The innovation was realised with a robust, long-lasting satellite design that resists the intense radiation from the upper Van Allen belt. Lord Browne said: "The 2019 Queen Elizabeth Prize for Engineering has been awarded to the four engineers who gave billions of people around the world free access to accurate and immediate position and timing information. It is our hope that the revolutionary work of Dr Parkinson, Professor Spilker, Hugo Fruehauf, and Richard Schwartz - which epitomises the engineering excellence that the QEPrize both recognises and celebrates - inspires the next generation of engineers to take up the challenges of the future." Professor Sir Christopher Snowden, Chair of the Judging Panel, said: "The global positioning system provides an outstanding example of engineering's profound impact on society. It epitomises what the QEPrize stands for; starting with an almost impossible challenge, GPS is now universally accessible and benefits billions of people around the world each day. Over time its varied applications have profoundly transformed how society operates, and its impact will only continue to grow. This is exactly the type of groundbreaking engineering achievement that inspires young people to become tomorrow's engineers." The four winners will be formally honoured at a ceremony later this year; they will receive the £1 million prize and an iconic trophy designed by the 2019 Create the Trophy competition winner, 16-year-old Jack Jiang from Hong Kong.